Christen Conley controls the ball. The sophomore has four assists on the season. 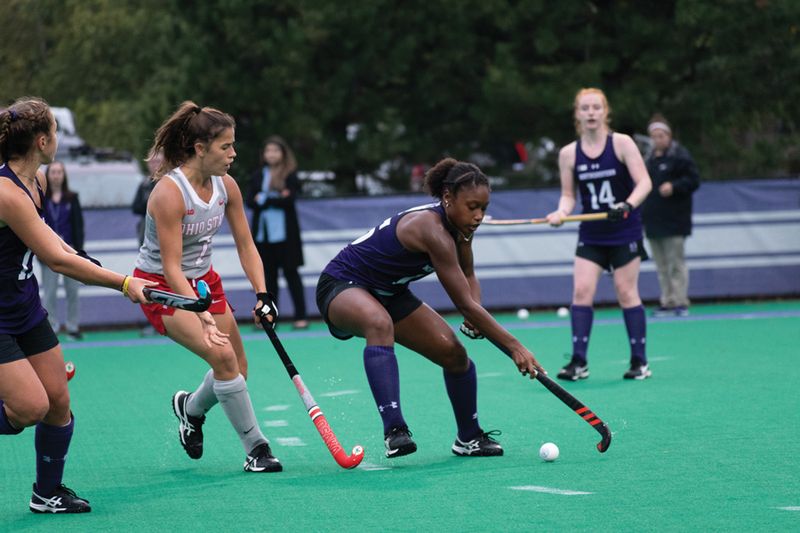 After a recent skid in which Northwestern has dropped four of its last five games — including the last three by one goal each — all but eliminating any hope for an at-large NCAA tournament slot, the Wildcats head into a weekend tilt looking to prove their mettle. No. 17 NU (8-8, 3-4 Big Ten) heads to No. 2 Maryland (15-1, 6-1) on Friday before returning to Lakeside Field to play Ball State (2-12) on Sunday. Despite the Cats’ losing stretch, the mood surrounding practice this week was decidedly upbeat, with players and coaches looking to use the weekend as a barometer for the team’s Big Ten Tournament chances. Fuchs said NU’s record doesn’t fairly reflect the talent of its players or the work they’ve put in to be better during practices. The team has no mathematical chance to top the Big Ten, so there’s no pressure to win over the weekend — a fact she said will allow the Cats to gauge their potential for postseason tournaments and gain confidence. The team has failed to avoid defensive lapses in their last few games. But the past week of practice has given Fuchs confidence she’ll see a good effort against the Terrapins. The week of practice has allowed Fuchs to address the team’s greatest liabilities, rebounds and corners. Junior goaltender Annie Kalfas and the rest of the defensive unit stayed on the field for an extra 15 minutes at the end of Wednesday’s practice to work on those issues. The team, Kalfas said, isn’t disheartened by its recent one-goal losses. Rather, they are a symbol for how close this season’s games have been. “They’re all one-goal losses, so we just gotta get better at finishing our opportunities, making up (those) one goal differences and not letting that kind of supply us again,” Kalfas said. Senior midfielder Eva Van Agt said the urgency the Cats displayed in the second half last week against Penn State is exactly how they need to play at all times. Van Agt said though the results the team has seen in recent weeks have not been up to par, the manner in which they’ve been coming is encouraging.